Website: Follow PAC on Facebook! 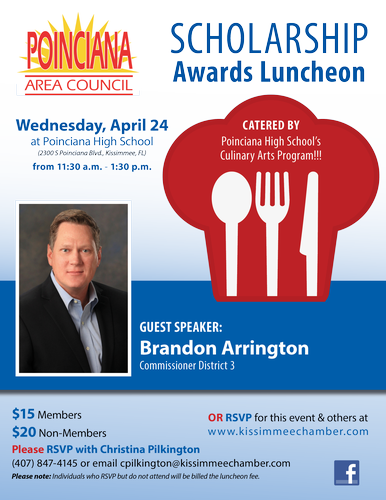 Join the Poinciana Area Council as they honor four worthy graduating seniors from the Poinciana area and celebrate continuing education in Osceola County. This year students from Liberty High School, Poinciana High School, and New Dimensions High School will each receive a $500 scholarship to the school of their choice. Osceola County District 3 Commissioner Brandon Arrington will speak. This luncheon is catered and served by students of the Poinciana High School Culinary Program. Join us in honoring the awesome kids in this unique program! Attendees are encouraged to bring a school supply donation for PAC's donation drive to benefit Poinciana schools in 2019-2020 school year. *Registration will begin at 11:00 AM. *Individuals who RSVP but do not attend will be billed the luncheon fee.